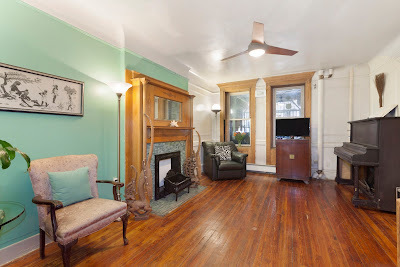 The official open house was scheduled for 1:00pm, but I had arranged to meet the realtor, Beverley Draggon of Douglas Elliman Real Estate, at 12:30 for a private pre-tour. I arrived at noon and lingered outside, chatting with the friendly neighbors and playing with their cat. The next door neighbor joked that Harry visits him from time to time. I then learned that a pub once sat on the corner, and neighborhood lore says that Houdini had a tunnel running from his house to the pub. Not sure I buy the tunnel story (sounds suspiciously like Laurel Canyon), but it was cool to learn there was a pub here in Houdini's day. Promptly at 12:30, the friendly (and wonderfully tolerant) Beverley Draggon arrived. She unlocked the front gates and after so many years of dreaming about this moment, I was on my way inside 278. 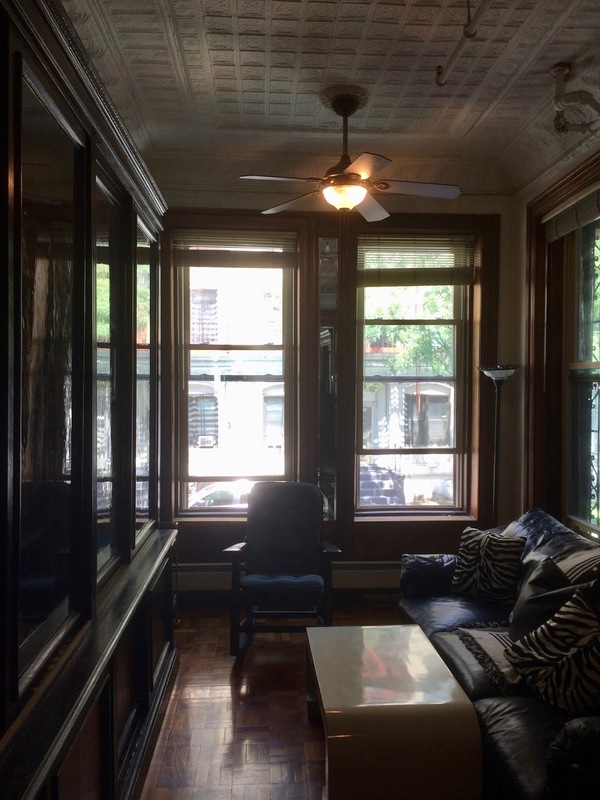 You enter 278 on the second floor (in brownstones what's known as the Parlor Floor). In the past, many mistakenly call this the 1st floor and thereby confuse subsequent floors. The front double doors open into a small, beautifully paneled anteroom, and then a second single doorway opens into the foyer. This second door was the trick door that, in Houdini's time, opened from the hinge side when you turned the door knob. I searched for evidence of the trick hinges, but a metal housing has now been laid over where any evidence would be. The foyer is beautiful and dramatic. Beverley pointed out that the wood work is all original. The unique lattice around the stairs had been in "bad shape" and were restored. There's a large mirror flanked by coat hooks. The mirror glass has been replaced, but the wood frame and hooks are still original. Yes, this is where Houdini hung his hat after a hard day of escaping straitjackets. 4th Floor - Bedrooms, Bess's Bathroom, Workroom, Office. 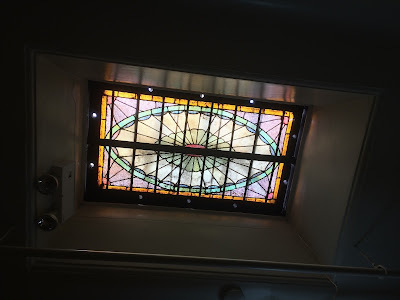 What one notices right away when reaching the top of 278 is the original stained glass skylight over the stairwell. In Houdini's time, this could be cranked open. The hallway here feels especially cramped as a wall has been added to enclose the back rooms into its own apartment. Beverley unlocked the door and in we went. Marie Blood gives a very good description of the 4th floor, and what she describes is very much still there. The guest bedroom Marie stayed in while visiting is a small room on the left. Beside it is a larger bedroom with fireplace where Bess's mother lived. According to Marie, Julie Karcher also lived on this floor. It's possible she stayed in what would have been another small room adjacent to Mrs. Rahner's room, which is now a kitchen. As one moves down the narrow hallway toward the front of the house, there is a small bathroom just past the kitchen. For whatever reason, I didn't look inside, and I'm kicking myself for that! That's because I later learned this was Bess's bathroom (Harry and Bess had separate bathrooms), and Dixie Dooley records that the tiles here sport the initials "BH." 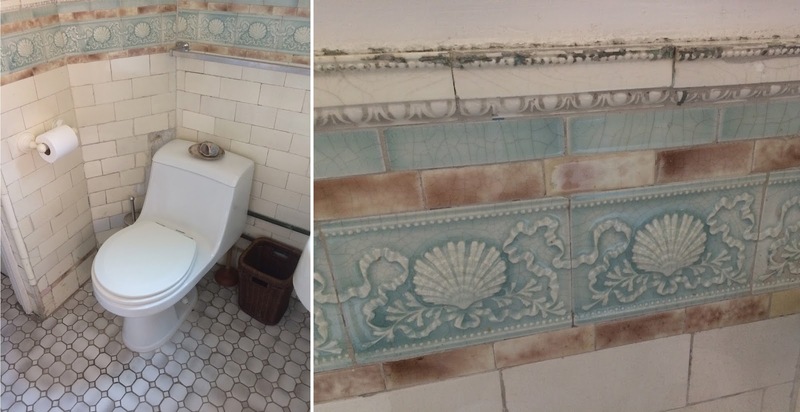 Did I miss seeing those tiles!!!??? Maybe the reason I overlooked the bathroom was because I was within steps of entering a major room. Both Marie and Marcet Haldeman identify this large front room as the workroom -- "Houdini Headquarters" if you will. 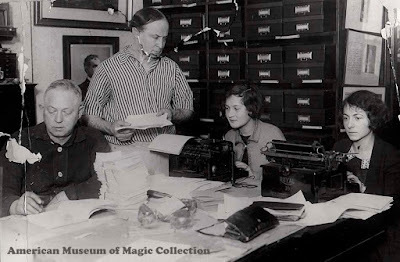 It was here that Houdini's secretaries typed his letters and where his library was cataloged by Alfred Beck. Marie Blood says, "There were always lots of people in there and everyone was busy." The below photo shows the room today and the workroom in action in Houdini's time. 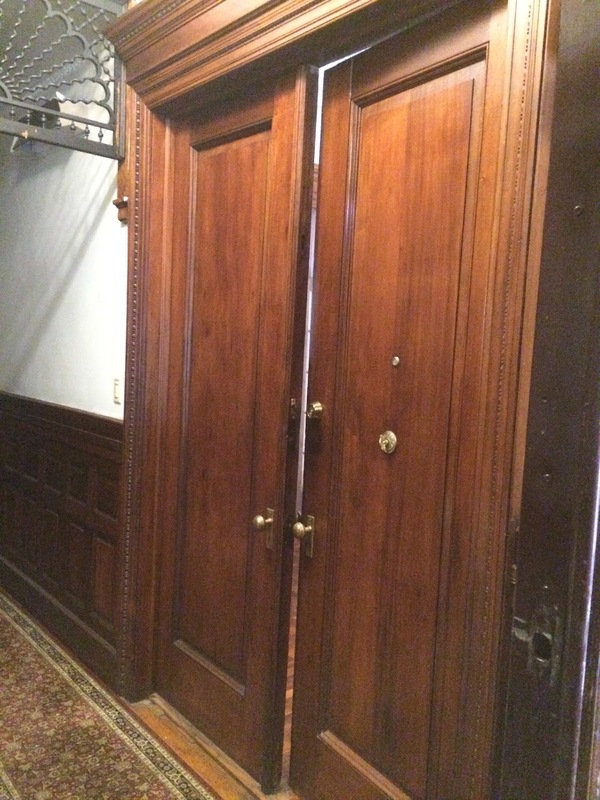 Both Marie and Haldeman say this is also where Houdini had his office. Haldeman gives an especially good description of the jam-packed room in a small "nook" off the workroom. That nook is still there, and I was expecting to find a great photographic match. But I admit I did not. In fact, the way the room is closed off, I have no idea how the famous photo of Houdini in his office was achieved. There is also an early photo of 278 that shows this as an open balcony, but I expect it could have been enclosed in Houdini's time. 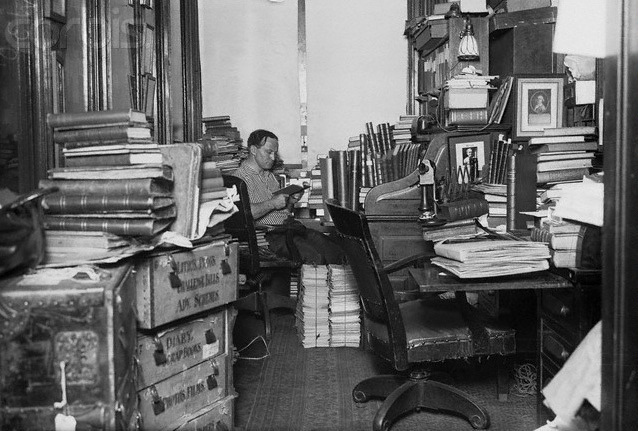 So even though I couldn't really make a match, the eyewitness accounts of this being Houdini's office are strong evidence, and it makes sense the office would be off the workroom. So I'm going with this as the location of Houdini's office. But I'll discuss a few other candidates as we continue the tour. 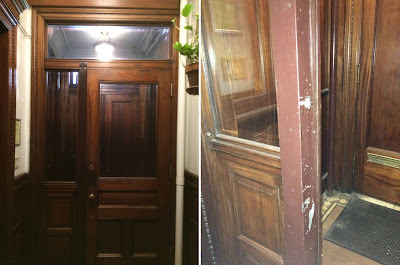 [Update: Houdini's office inside 278 is finally FOUND!]. For much better photos of all the 4th floor rooms, check out THIS POST from 2016. 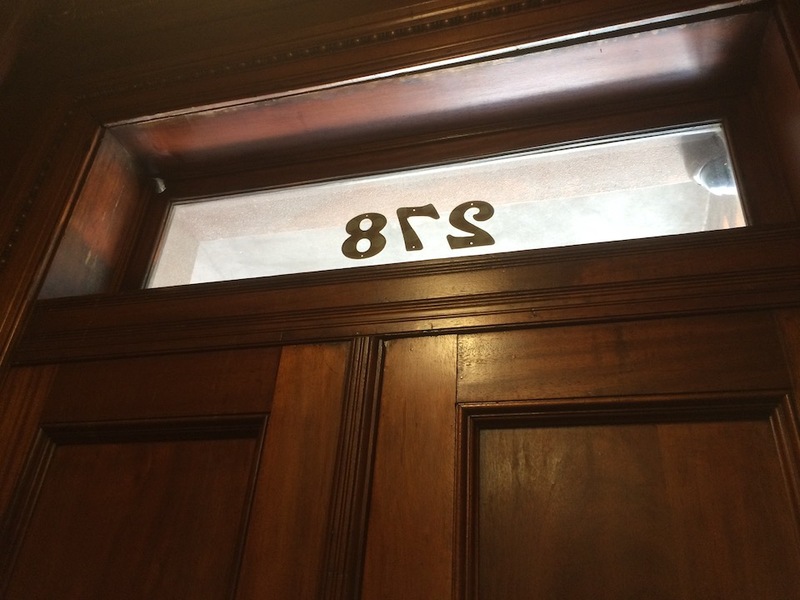 3rd Floor - Harry and Bess's Bedroom, Houdini's bathroom, Sitting Room, Office? 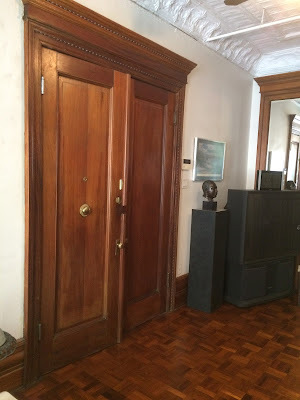 Marie Blood says that Houdini and Bess's master bedroom was on the third floor. It's also here we see the basic layout that all subsequent floors follow; two large rooms front and back with an open room connecting them. While I'm not 100% sure, it appears the back room was Harry and Bess's master bedroom. Having botched my attempt to capture a panoramic photo of the workroom, I did pull off a nice panoramic of the bedroom (below). 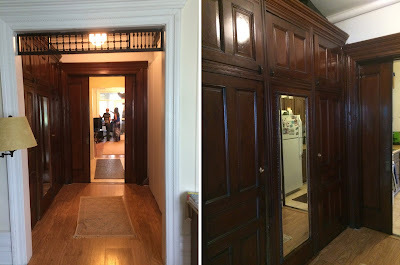 The second set of photos show the connecting room with the original closets and dumb waiter (now a closet). Off the bedroom is Houdini's bathroom. This is where he is said to have practiced holding his breath in an "oversized" bathtub. The bathroom is not much changed, except that it now has a modern tub and toilet. The original tubs are still in the house (more on those later), and while maybe large by 1904 standards, they appear perfectly normal. 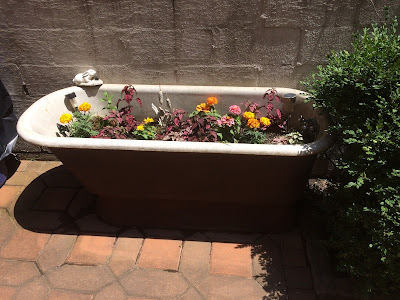 In fact, the area where the tub sat would not accommodate anything larger than what we'd consider a normal tub. And while the tiles on the walls appear original, the floor tiles have been replaced. So if there ever was an "HH" to be found here, it's long gone. Finding myself alone in the bathroom, I resisted the temptation to use the facilities, just to say that I did. But I did snap a photo of the toilet area. After all, this is where Houdini must have done some of his best thinking. Moving through the connective closet room (and new kitchen), one enters a large front room. 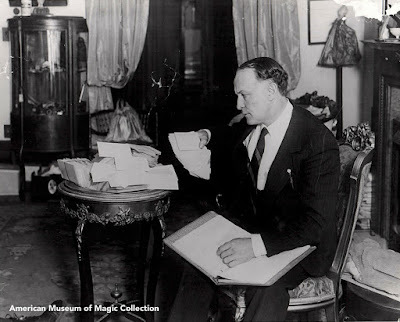 One of my missions was to identify where the photo of Houdini sitting reading his mail was taken. Luckily, the photo shows a fireplace with distinctive features directly behind him (all six fireplaces in the house are different). Sure enough, the fireplace in this room was a perfect match! 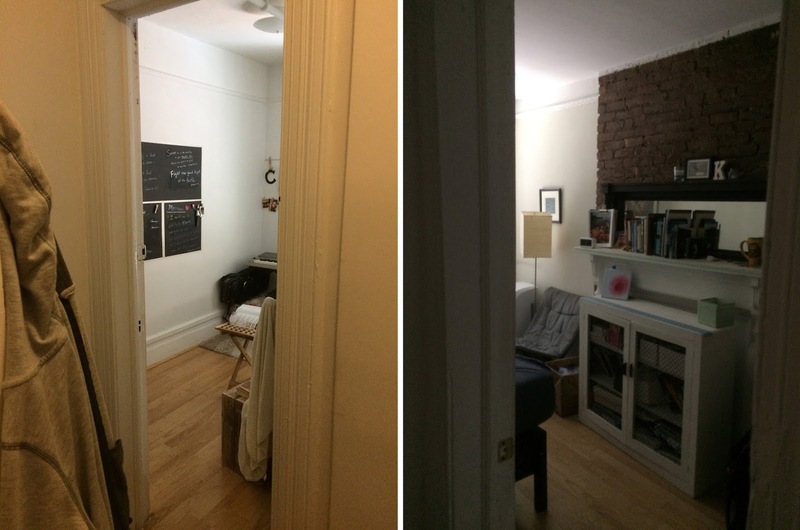 One can also clearly see the doorway into the connecting rooms, so the whole geography snapped into place. It was my first firm photographic match of the day and an exciting moment. 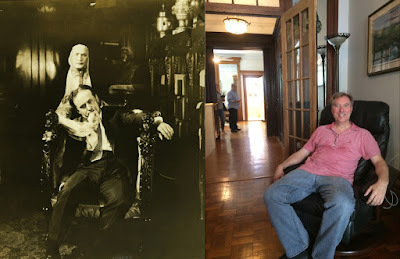 Even though I was in Houdini's house and knew he was everywhere, this somehow brought him into the room in a way that confirmed for me that, yes, this is the place! Off this front room is yet another closed off "nook." 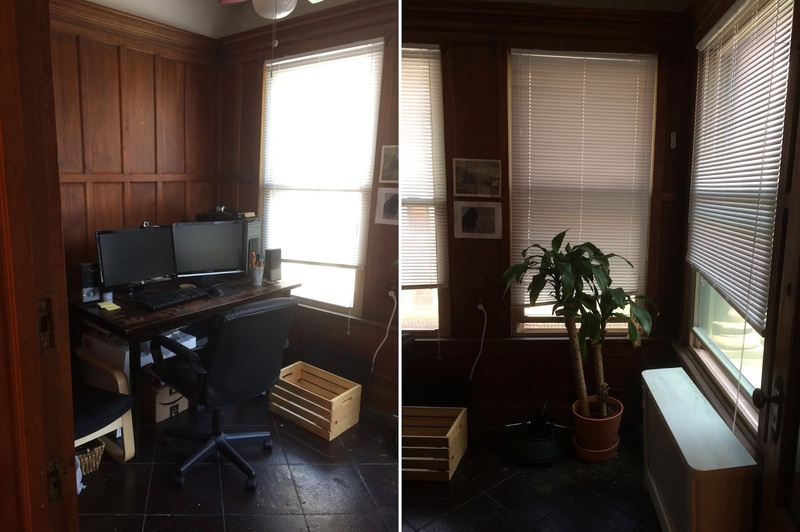 In many regards, this seems to be a much better photographic match for Houdini's fabled office space. Even Beverley felt this room was the one in the photo. Could Houdini have had his office here at one point and then moved it upstairs? Possibly. Looking through the windows, I could see people beginning to gather out front. It was time for the official open house, so we headed back downstairs to the most famous and most photographed part of 278 -- a floor where there is little question about what it was like in Houdini's time. 2nd Floor (Parlor Level) - Foyer, Trophy Room, Library. 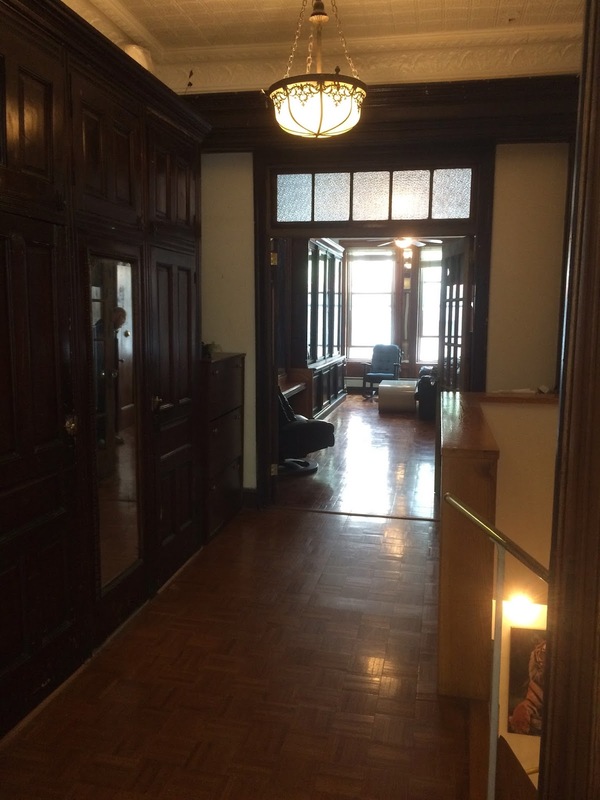 As I described earlier, a large pair of double doors sit off to the right of the 2nd floor foyer. We now pushed through those doors and entered is the spectacular parlor. Here all the original wood work and high tin ceilings remain. This was Houdini's trophy room, well remembered by all who visited the magician. Haldeman called it "a veritable fairy tale like room." Here Houdini had display cases filled with mementos from his career, a collection of wands from famous magicians, and his bronze bust that sat on a pedestal in a far corner (the current owner has a bronze of Martin Luther King sitting near the same spot). Dixie Dooley's illustration shows the room was actually subdivided with a paneled wall sectioning off the window area into a small sitting room. This is the room where I spent the majority of the day. I found myself returning here again and again. This room just felt like "home." 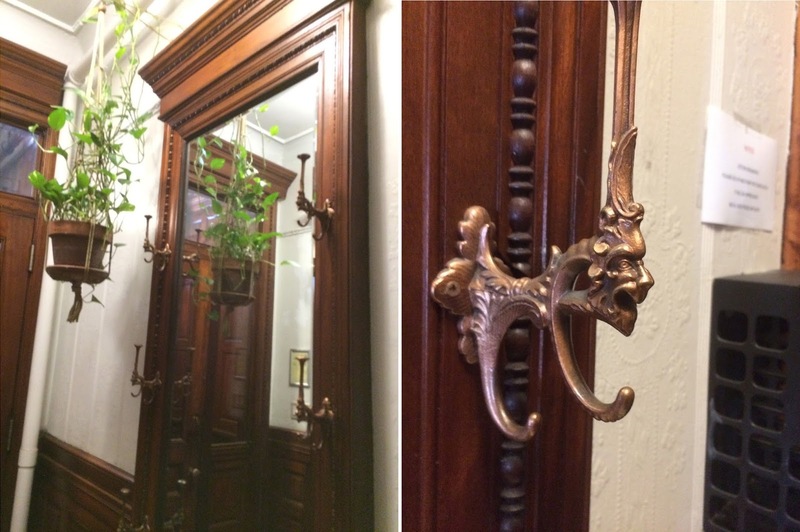 One exciting feature of the parlor was that it still held one of Houdini's original bookcases. However, Beverley informed me that the case did not sit here in Houdini's day. The current owner moved it into the parlor. This case, along with another identical bookcase, sat in Houdini's library in the back of the house on this same level. But that didn't stop me from recreating the photo of Houdini leaning against the bookcase. In fact, almost everyone at the open house took turns in this spot. How could we not? 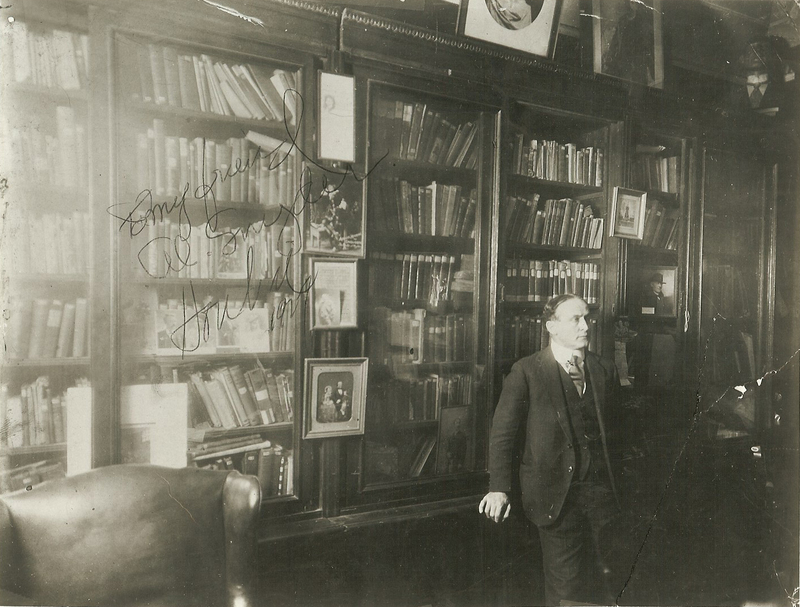 Because there were two identical bookcases in Houdini's time, one has to wonder if the surviving case is the same one Houdini is leaning against in the photo. Is there some way to tell? Turns out, there is! One of the open house attendees was Alec Mathieson, a young actor and Houdini buff who recently toured with the musical Ragtime. 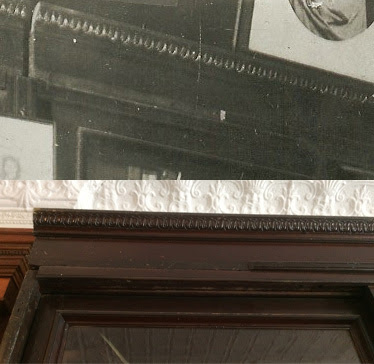 Looking at the Houdini photo, Alec spotted a strip of missing molding along the top of the bookcase. Our eyes went up and, yes, that same molding is missing from the bookcase in the room. This might have been the discovery of the day. Way to go, Alec! 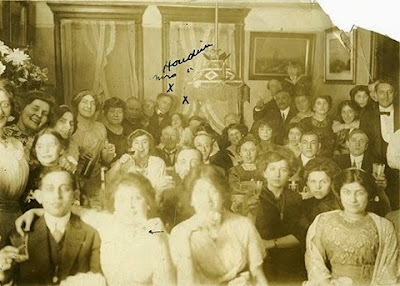 I was also able to make other positive identifications and recreate a few other famous Houdini photos taken in this room. 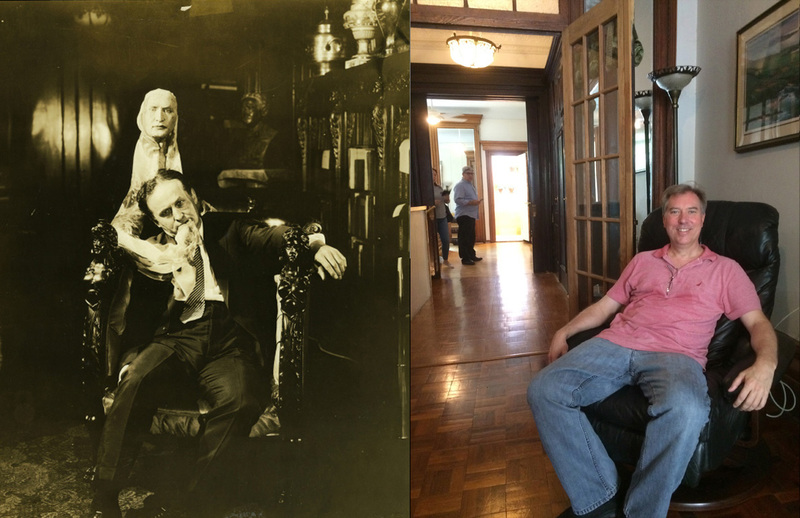 A chair was sitting in almost exactly the same spot where Houdini took his famous "ectoplasm" pic. (David Jaher, author of the The Witch of Lime Street, was sitting here when I made this match, which I thought was appropriate.) You can also see a chandelier in the background of this photo which still hangs in the house today (the sliding doors into the back library are closed in the Houdini pic). By this time the open house was in full swing. The idea was to only let a handful of people in at a time. I did my best to help Beverley out, but I'm afraid I was pretty bad at my job as I kept wandering away from my post. Also, as Beverley tried to sell visitors on the practical features of the property, I was all too eager to interject that Harry Houdini spewed ectoplasm on this very spot! But I think we were all having fun, and soon Beverley's very nice partner Detria Davu arrived to help. 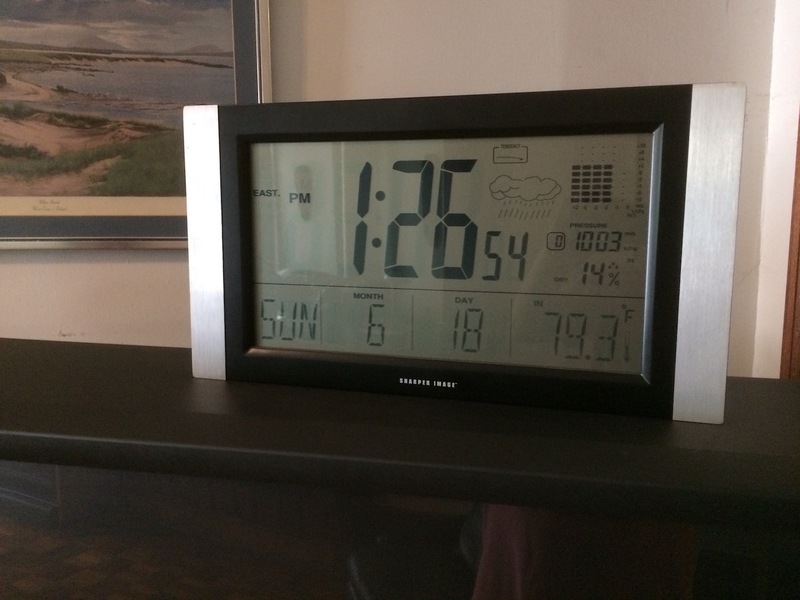 By the way, at one point I happened to glance at the clock. Look what time it was. Yep. In the back of the 2nd floor is today a master bedroom. In Houdini's time, this was his formal library (again, well described by Haldeman and drawn by Dixie Dooley). This is where the two bookcases sat along the back wall (behind the bed) and is where the famous photo of Houdini was actually taken. Across the room is a fireplace. The below photos are the only two images I captured of this important room, so I've also included the realtor's listing photo for a better look. The door you see to the right of the windows leads to a modern master bathroom. What was this in Houdini's day? Curiously, Dixie Dooley's illustration shows no room here at all. But the structure of the house suggests there was always a room of some kind. So what gives? An interesting possibility arose a few days later when Roger Dreyer of the Houdini Museum of New York told me that, according to an unpublished document written by an assistant (who lived for a time in 278 after Houdini's death), Houdini had a "secret room" where he conceived his most important effects. Even the maids were not allowed in this room. 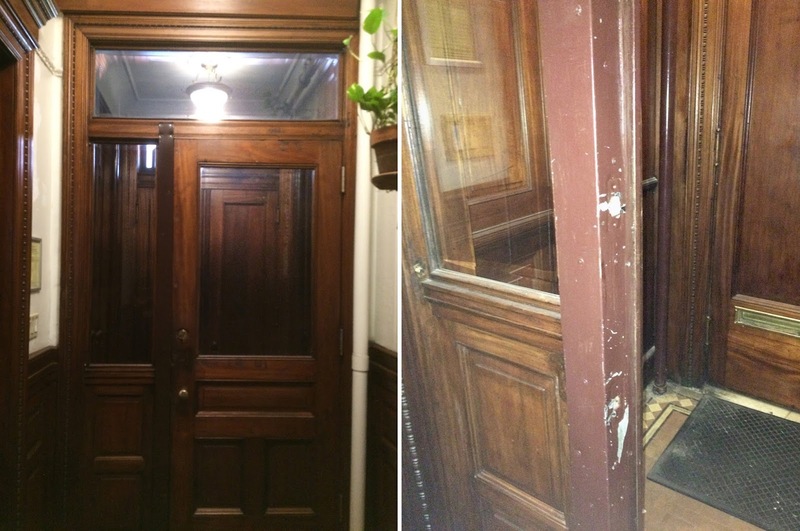 Could this have been Houdini's secret room? For some reason, I discovered I had no photos of this room on my phone. Believe. 1st Floor (Garden Level) - Living Room, Kitchen, Backyard. Below the 2nd floor parlor is the 1st floor or Garden Level. 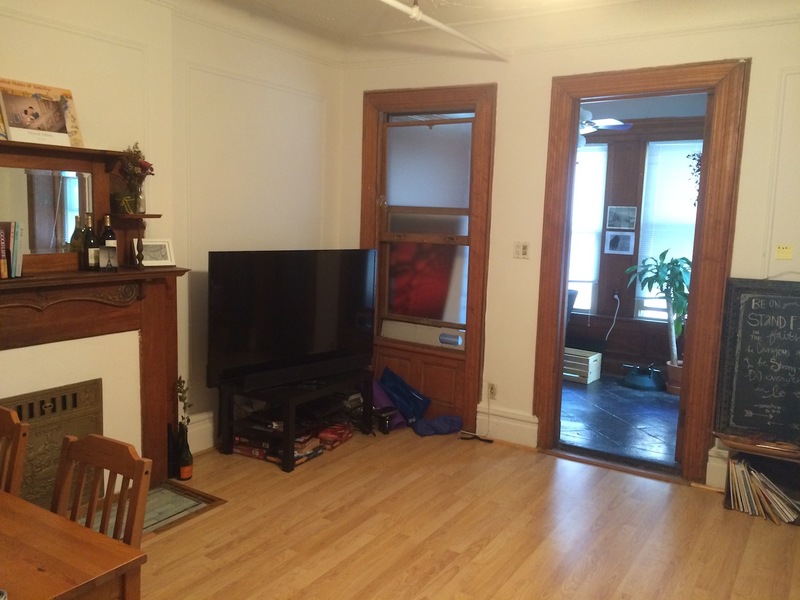 Here there is a living room with a fireplace. This appears to be where the group photo from Bessie's 35th birthday party was taken. Also in the room sits a piano that Beverley said was original to the house. Like the bookcase, it'll stay with the house. 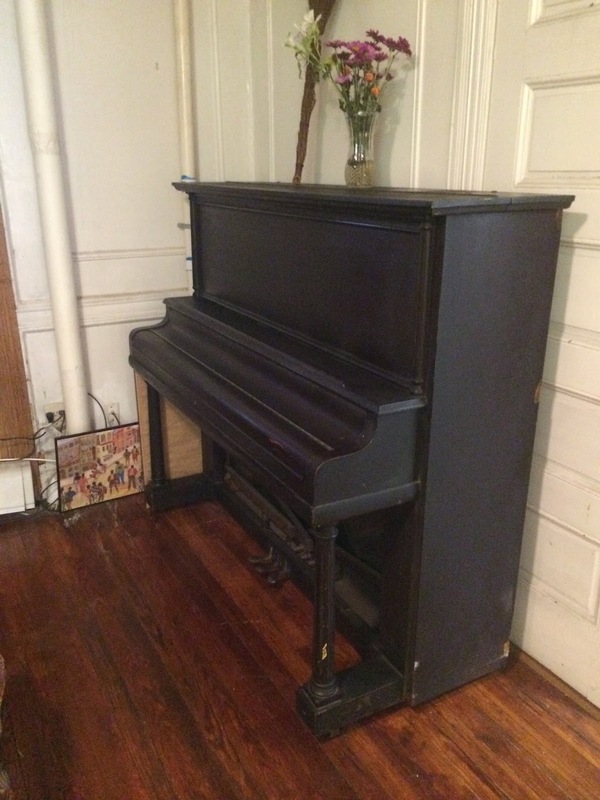 While I took a nice photo of the piano, I did not get a great photo of the room itself, which on this day appeared to be used mostly for storage. 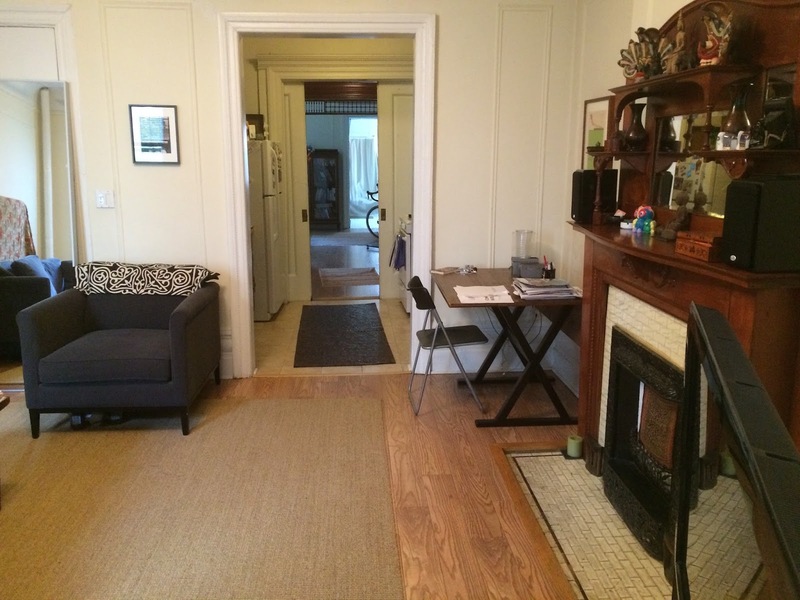 So, again, I've added the realtor's image to give a better sense of the room. This room also has its own street entrance, which I did not explore. But it was here Houdini is said to have smuggled into the house his latest book purchases and hid them in the basement from Bess. Having now seen how relatively cramped 278 is, even when book free, I think I understand Bessie's objections to her husband's chronic collecting. 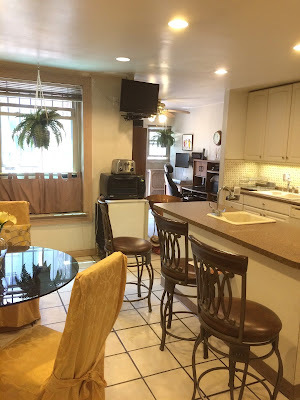 Behind the living room is the large kitchen area, well described by Marie Blood. While still in the same spot, the kitchen has been entirely modernized. I found I didn't want to be in a room in which I could not feel or see the original in some way, but I did appreciate finding here an ice bucket of bottled waters that Beverley and Detria had brought in for guests. It was a hot day! 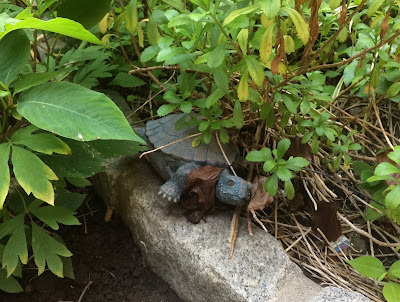 Remembering Marie Blood's story about chasing the Houdinis turtle "Petie" around the backyard flower beds, it amused me to see this fellow lurking in the leaves. Houdini's bust may have traveled away, but Petie's own immortalized likeness (or a reasonable facsimile thereof) has remained at home. 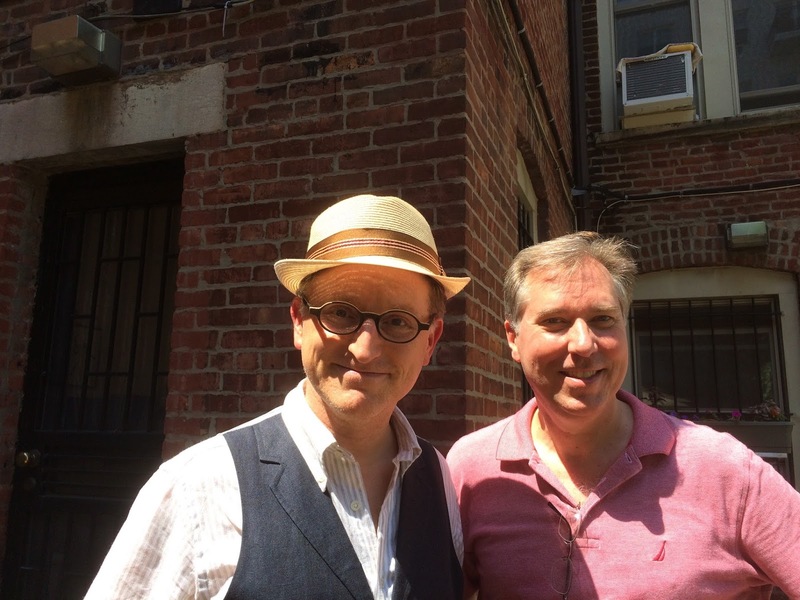 It was while I was in the backyard that I met the one celebrity magician who attended the open house, Steve Cohen. We had a nice chat, and when Steve told me he was an admirer of Frederick Eugene Powell, I pulled up on my phone a photo of Houdini and Powell standing almost exactly where we were standing at that moment. Of course, we had to take a pic. Thanks to the very nice Tímea Sánta for snapping the below. I lingered until 3:30 when it was time to lock up. It was hard for me to leave, and I felt genuine sadness as I realized I may never set foot in this house again. So I took one last photo at the front doorway, and then photographed my new friends Beverley and Detria, two wonderful women who gave me the Houdini experience of a lifetime. To view the official 278 house listing visit Douglas Elliman Real Estate. Stay tuned for more on my 2017 New York Houdini adventure. Houdini photos from the American Museum of Magic in Marshall, Michigan. UPDATE: For those wishing to know more about the sale history of the house, check out: The owners and occupants of Houdini's 278. Great piece, John! FYI, in NYC what you call the "second" floor is called the "parlor" floor in brownstones. I visited 278 also and was most intrigued by the dumbwaiter - big enough to hold a man! 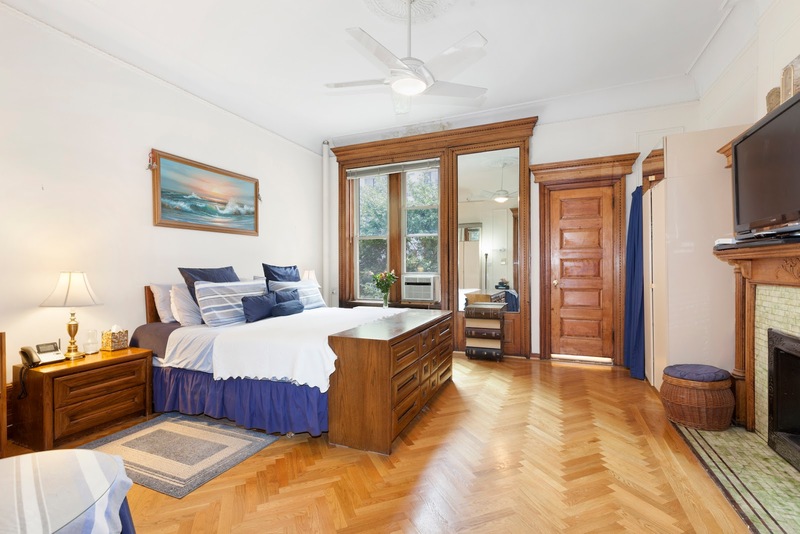 I also had the strong impression that for an 18-foot brownstone, most of the rooms seemed only 12 feet wide. Where are the secret passages? Yep, I refer to it as the parlor level several times in the above. 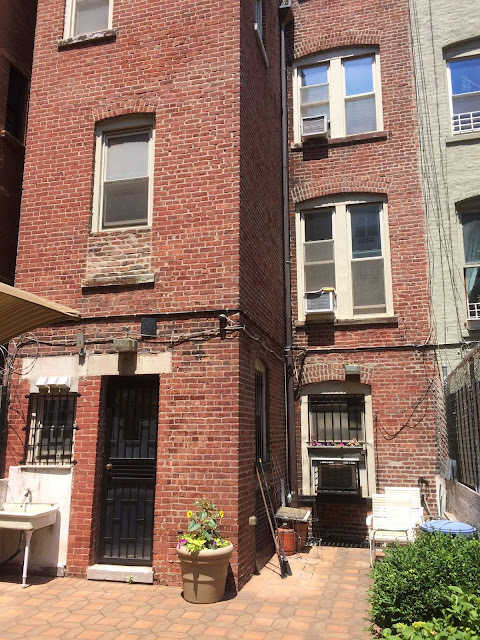 But for people who might not be familiar with brownstones, I wanted to number the 4 distinctive floors in a way that will be clear to all. No more upper floor confusion that way. Amazing stuff on 278. I am so glad you got to fulfill a dream and share it with us. WRT the pub that once sat on the corner of 113th Street, Dixie Dooley mentions it was coffee house in HH day and later became a pub; Houdini was known to have often stopped in to spend time with his friends and neighbors when he was out on his walks. Can’t wait to hear more about your NY Houdini adventure. Would have fun to have had you there Joe. Thanks for the info on the coffee house. Do we know the name of it? Utterly wonderful account. Gave me chills. What a thrill to have been there. Well done, John. Let's all hope someone from the magic world purchases this. Indeed, like I said, so much of the original house (pipes and whatnot) remain. This is best news I think I could have brought back. Double wow John! Thank you for that magnificent report, and thank you for taking lots of photos of the house. 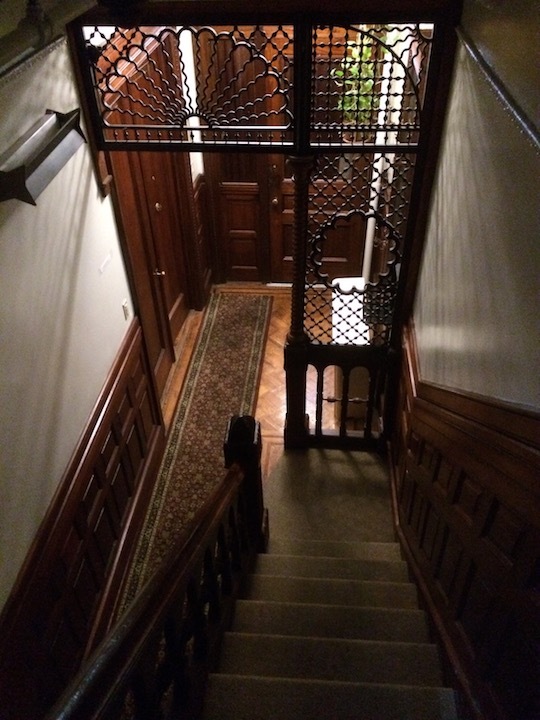 Those inside entrance photos are just eerie, knowing Harry walked through here a lot. Brownstone and townhouses are not wide structures, as David pointed out. Their space lies in the depth of the house. Thanks. The photos I took were serviceable, but not great. I found I just wanted to absorb the space and investigate instead of take photos. Thank you so so much. I am going to read this a second time - as I devoured it up too quickly. Good job John! Feel free to use the pics I sent. I have a short clip of the woodwork on the ceiling of the vestibule. It still looks perfect. I'll send it when I can figure out how. There might indeed be a few discoveries awaiting us. BTW, the owner has photos of the house pre-renovation. There was talk that he would leave those with the realtor for the open house, but he did not. Blown away by your article and must say I am very envious of you at the moment. What a grand feeling it must have been to be walking in Houdini's steps. Can't wait to sit down and talk about it in person. Wish you would have been there, Mark! Yes, let's get together this week. Might be time for Tallyrand. John, wow. I'm not often speechless, but this time around, wow. You have outdone yourself. All day Sunday, my mind was IN that house, though I was far away from it. I remember thinking, I hope there were other magicians there to take a photo in the backyard, and no sooner did this thought come into my head, I saw the photo of you and Steve Cohen on Steve's Facebook page. Just amazing. I linked this article from my site. It's just brilliant. Thank you, Dean. And thank you very to super endorsement and link on your site. Meeting Steve was a treat! He was playing it much cooler than I was, but deep down I think he was just as excited about being in the house as I was. Steve could afford it, and I joked that he should buy it "as an investment" and install me as the landlord. Maybe not such a joke. Incredible John!! No words can do this article justice but thank you for sharing this great experience with us! Magnificent. Thank you so much for sharing your experience, John. It was long overdue. My hope is that a wealthy Houdini historian or historical organization (name it the Houdini Memorial Association?) will purchase the home and turn it into an appointment-only museum without sacrificing its integrity. 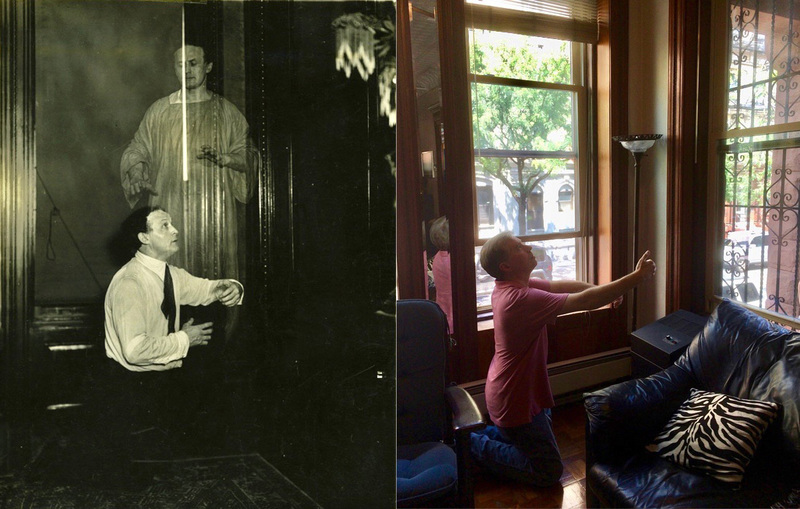 No disrespect to the present owner, but I think someone who truly appreciates Houdini and magic should own the home and share it with other Houdini historians, researchers, magicians, and true magic and history enthusiasts. I wouldn't necessarily let in the general public for fear the house would suffer the same fate as the Houdini Magical Hall of Fame. But to have the average Joe occupy such a historical place is heinous. If I had the money, I wouldn't have a second thought before making an offer. In any event, thanks again for the virtual tour. I couldn't agree more, Tom. I really, really hope someone buys it who will persevere at least some of the Houdini history inside. Certainly the parlor level should and can easily be kept largely as is. Of course, my great dream is that it would be turned into a museum, maybe even get some of the original furniture back in there. It might be too much to ask for the all the floors to be preserved/restored, but the parlor should be. It was place of Houdini tribute in Houdini's time and it would be wonderful if it remained that for all time. Maybe even the city would be interested in buying the house. Hope all options are being explored. Double WOW! Would love to have been there myself, but your description and photos help to tone down the jealousy. 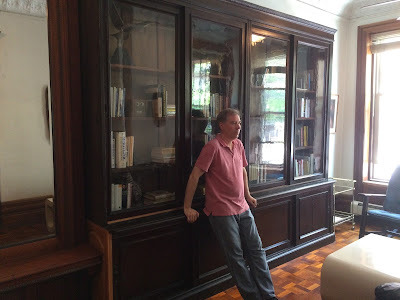 I was especially pleased to see the photo taken opposite the original bookcase location in the library. Many, many thanks. Thanks Bob. 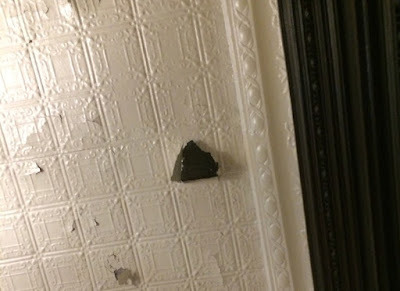 One thing I'm afraid I didn't do was try and figure out where exactly where the famous spirit slate hung. Must have been the parlor level. But was it in the front (trophy room) or back (library)? I am not jealous. Your description, of emotions as much as solids, makes this incredibly - personally vicarious. The photos add to the already vivid imagery, and I'd swear that I actually smelled lingering scents of another time. Thank you Grandpa Chet. As to smell, I was looking forward to the house having a distinctive smell, but it didn't. No smell at all on the upper floors. The Parlor level had a very pleasant, almost sweet smell that I couldn't quite figure out. It certainly completes a dream in regards to the house. It's wild to think that just just a few weeks ago I had no idea what the inside of the house was like and no real hope that I ever know. Now suddenly I know the house inside out. It's been a whirlwind adventure. This perfectly captures what you've given to your fellow Houdiniphiles! Visiting 278 was nearly the first thing I did on my first visit to NYC, though the way was shut. So your report allows me (and others like us) to tick that box. As for conservation of the site... maybe Raymond Teller needs an urban retreat! Thank you for letting us live vicariously 😁. I hope this allows one to live vicariously. BTW, this was just the first stop of a full Houdini day. I'm sitting down now to work up the rest. John`s notations in red throughout the floor plans are great. It clarified much for me. I always thought that the archway on the sidewalk level was the basement entrance. Turns out it`s the 1st floor garden level. Me too. That was a revelation. FWIW: the first floor garden level has also been referred to as the basement and below the basement was the cellar. *bump* Sorry I missed the beer and brats. Next trip for sure! I liked that you played with the neighbor's cat. Oh, and the information & photographs were fantastic! I'm very glad that you have achieved a life-long dream of yours. Thanks for sharing with us, and the world! A point of clarification on the 4th floor bedrooms. The occupants I have here are as Marie Blood described them, which was probably 1925/26. Many family members lived in 278 over the years, and I expect the bedroom occupants were ever changing. It wouldn't surprise me if Mama occupied the master bedroom until her death. John - What an amazing, magical article. I really felt like I was there at 278. I'm glad you did the trip and even glad you shared with us lucky readers. Nice story John I am stunned. Thanks for sharing your experience! Wow, great article and incredible journey. Everything came together, with no time to spare; the realtor’s invitation, the flight, the place to stay, you arriving 30 minutes early, and on and on. Plus, a lot of great photos. My favorites were of you in the two “ectoplasm" pics. Also, that picture of you and Steve Cohen, him mentioning Powell, then you having a photo of Houdini and Powell standing on the same spot. That’s not luck. There’s something else at work here. This adventure must’ve been Karmic. Forget the Hippodrome, you’ve stood in Houdini’s bathroom! Wowee! What an amazing and fulfilling account of this wonderful house and contents! I'm jealous - it would be such a dream to see this in person (to say nothing of *living* there! ), but this post is at least a vision of said dream, and aside from a few distracting typos, it was a very immersive, informative, and imaginative experience. :) Great work on the photos too! John said "If there are any whoppers, please shoot me" - Wait! STOP! He said 'shoot me an email,' honest to Mergatroyd! This link has some nice photos of the top floor. Thanks so much for doing such a thorough walk-through and write-up so all of us can enjoy your experience vicariously. I was completely geeking out over all the little details you managed to capture. Totally made my day. I may even have to revise my miniature 1:12 scale 278 to correspond with all the new info! The house is so beautiful, and it's great to see that so little has been changed since the Houdinis lived there. 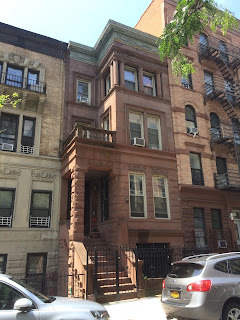 Even as a brownstone, it must have seemed like a palace (at least until Harry's book collection started to expand! )after living in boarding-houses and hotels for so many years. As someone who is a believer in preserving history, I really hope that whoever buys it is someone who knows and cares about the Houdini history behind it, and is willing to at least restore and look after it, if not open it as a museum. If I had the money, I'd buy it in a heartbeat. This is destined to become another of Wild About Houdini's classic, most-read posts for sure. Thank you, Meredith. And I couldn't agree more. I hope whoever buys it appreciates the history and helps preserve it. Which brings me to that $4,000 photo of Bess' 35th birthday party. Where was it taken in 278? My best guess is in the living room of the garden level. The two Windows in the back match and the door on the right matches with the door behind the piano. It makes sense to place that photo on the garden level because the kitchen is also there to feed all those people in the picture. Yes! I think you have it! It's an excellent match. I updated the story with the pic. Again, great catch! You've welcome! You deserve the credit for this find by adding many more pieces to the puzzle of 278. I just put a few of those pieces together. Amazing. This makes 60 essentially positive comments. This has to be a record in many ways. So glad you made the trip. A real eye opener, revealing so much. We lived in New York City many years when we had The Magic Towne House on 61st and Third Avenue, with our top floor original New York Houdini Museum, that included the bust on loan from the Society of American Magicians along with other items, visited the house at 278, but never got inside. The Only Building in the World Dedicated to Houdini! It's shame you never got inside 278 in the '70s. From what I understood, Rose Bonanno was fine having having Houdini people inside. I know they even had a seance there in the early '70s with Walter Gibson. FYI, in this post I originally wrote that the two bathtubs are for sale. I recall Beverley the realtor telling me this. But Jon Oliver says he called and she said they were not, that they come with the house. I know she said the bookcase and piano stayed with the house, but I really thought I heard her say the tubs were for sale. So until I know for sure, I've zapped this from the article. I can confirm That Beverly told you that the tubs were for sale. Fantastic, John! I wish I could have been there with you! And I wish I had access to all this before writing the novel. (But it seems like I got most of the layout right. 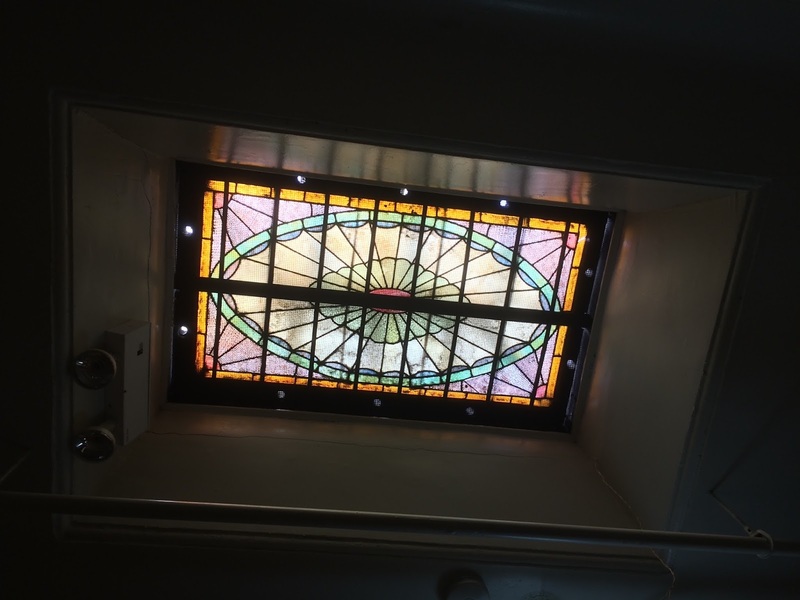 I was happy to learn that there actually is a skylight!) As always, extensive, informative, and well written! Nicely done! I've now updated with an alternative plan for the 3rd floor. 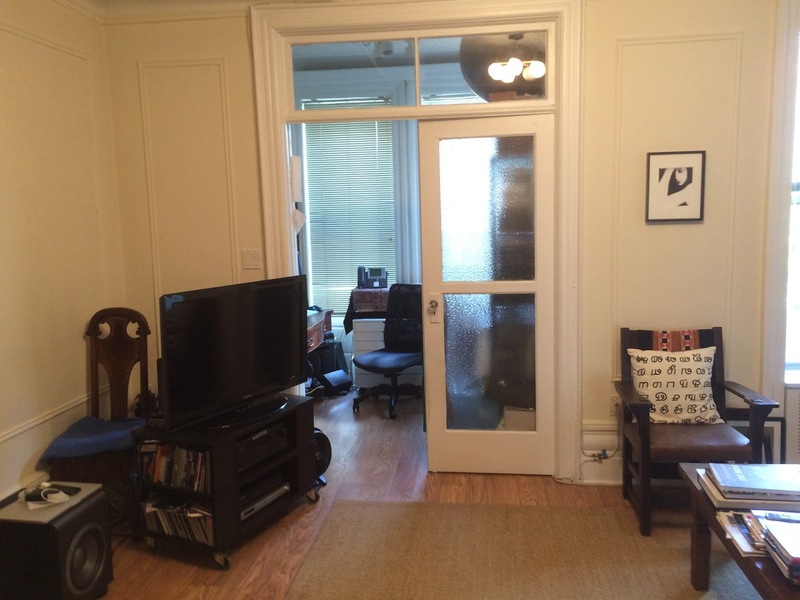 Great catch on that expanded back room that was originally smaller. Your revisions make sense. So the outside terrance has no door? I thought it did. I'm sure it had a door back in the day, but it is no longer an outdoor terrace and the door has been changed into a window. Or at least I think it has. There was a desk against it, so I actually couldn't see it. But if it was a door, I'm sure the realtor's floor plan would show it. Astounding! Maybe one of us with a powerball lotto win could museum it.... It could happen. Thank you so much for the kind words. It's an honor to have you comment here. I've turned to your book many times as an essential research tool. Thank YOU for your hard work and devotion to HH. What a terrific article! I kept scrolling up and down studying your modern photos along with the old ones you presented. I love old houses and especially if they were lived in by someone I admire. I know the individual is gone but somehow a part of him or her can still be felt. For me, often it's in looking at something common or everyday, perhaps,sunlight coming through a particular window for example, that the individual may have seen on a long-ago day. I wonder what the person was thinking as they gazed at the same sight? Perhaps, they were engaged in writing and looked up momentarily? or had just took a break from some other occupation from yesteryear. But, that's me and how I would have been thinking if I had been able to visit Mr. Houdini's "once-upon-a-time" home. As an aside: I saw the photograph of the clockface: and noted 1:26 pm and as a reaction I glanced at my own stove clock here in the kitchen: 1:26 pm! Spooky! Thought I'd better get off and get some housework done. Actually, I realized that I had spent over an hour on your most interesting site. But it is time well spent in my opinion. 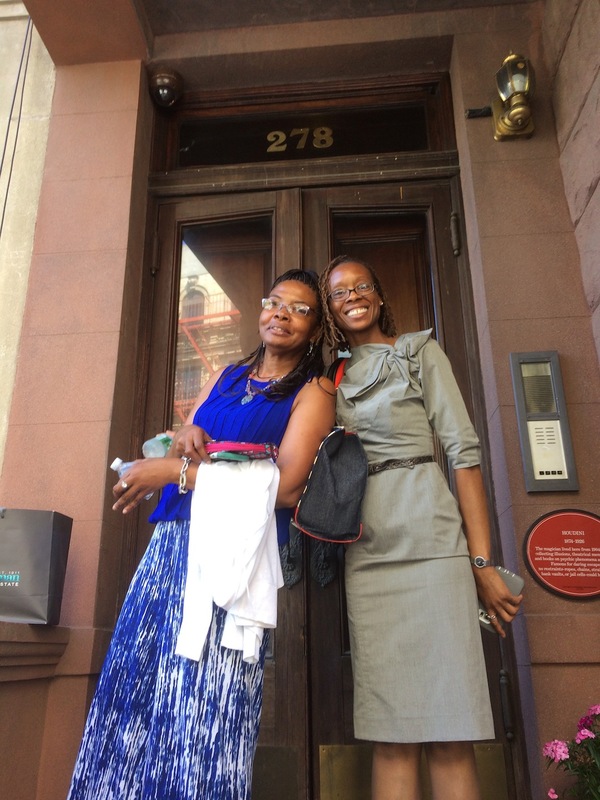 Thank you again for sharing your "278" experience. Thank you so much for the excitement and kind words, Margie. You know, at one point I looked through a side widow to see who was waiting at the front door, and it suddenly hit me that I was doing something Houdini probably did all the time. I felt like I had suddenly and naturally fallen into his own habit. Kind of cool. 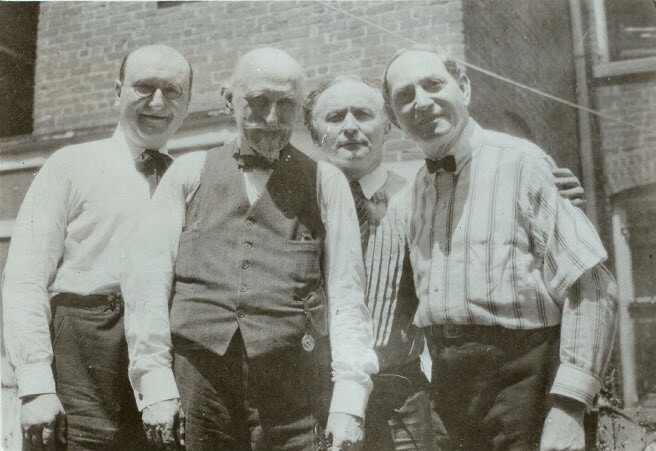 For those interested in the history of the house, check out this post: The owners and occupants of Houdini's 278. What a great tour of the house. Linking the old and new photos gives us a real window into the changes.